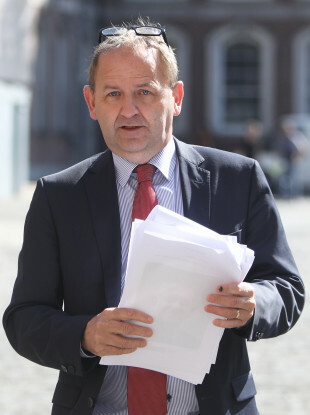 SUNDAY TIMES INVESTIGATIVE journalist John Mooney has told the Charleton tribunal he was not negatively briefed about garda whistleblower Sergeant Maurice McCabe. The tribunal is looking at allegations by former garda press officer Superintendent David Taylor that he was directed to smear McCabe. Former commissioners Martin Callinan and Nóirín O’Sullivan deny there was any smear campaign. “I personally was never briefed negatively by Superintendent Taylor or any member of An Garda Síochána who attempted to suggest McCabe was involved in child abuse or something like that. That did not happen,” Mooney said. The DPP directed no prosecution after a garda investigation into allegations by Miss D in 2006, stating that there was no evidence of a crime being disclosed. Mooney said that both former commissioners had threatened to sue him at various times over articles he had written. “I don’t think they would have been passing me confidential information with a view to undermining anyone,” he said. I don’t think myself or the Sunday Times would have made suitable targets for that kind of information. “Most of the communications I had with David Taylor when he was press officer involved legal threats against me. I don’t think I would have been suitable fodder for a smear campaign,” Mooney said. Mooney said that on one occasion, “someone made a very fleeting reference to an allegation against Sergeant McCabe”, and he subsequently made an inquiry and was told there wasn’t anything to it. Mooney said the person who made this reference was a civilian, not a garda officer. He also said that the fact that McCabe was still serving and not suspended was also an indication that the rumour was without substance. “I treated such matters as gossip and noise,” Mooney said. Mooney said that the allegations were dealt with by a system, and he believed in the system. The Sunday Times journalist said that he felt the allegations against McCabe “weren’t fit for public consumption”, and there were serious privacy issues involved. He said that he recognised that articles written by Paul Williams who interviewed Miss D in April 2014 referred to the allegations against McCabe. “To be perfectly honest, it wouldn’t have been material that would be published in the Sunday Times,” said Mooney. Following an RTÉ Prime Time report in 2017, Mooney said he made efforts to approach Miss D on Facebook. “I think I identified her through her father. She was linked in as a friend to her father’s Facebook account. “When Prime Time broadcast the documentary, it was my job to try to establish accurate information on what happened,” Mooney said. Mooney said that no other journalist came to him to say they were negatively briefed about McCabe. Irish Sun journalist Eavan Murray also gave evidence before the Charleton tribunal and said she would not allow herself to be used in a smear campaign. Murray said she did not believe she was ever negatively briefed about Sgt McCabe by Taylor or any garda. She said no garda ever told her that Sgt McCabe was a child abuser. Murray said she was in contact with Supt Taylor, as shown by telephone records of texts and calls, but said she was not covering the McCabe story for her newspaper. Her focus was on crime, and she said the penalty points scandal was more of a political story. Murray visited the home of Miss D in early 2014 to seek an interview. She did not meet with Miss D, but spoke to her parents, Mr and Mrs D.
“When I heard the story I can remember being somewhat surprised at the minor nature of it,” Murray said. Murray said the D family were concerned that journalist Paul Williams had video taped an interview with their daughter, and asked her of her experience of people who went public with allegations. “We heard Paul Williams had some huge exclusive that they intended to run in the Irish Independent over a number of days,” Murray said. However, the Independent did not run a story for some time, and when it did, the story was anonymised and did not name Sgt McCabe or Miss D.
“I never wrote about it, and I would never allow myself to be part of a smear, I would never allow myself to be used like that,” Murray said. Murray said that Mr and Mrs D seemed “exhausted” when she spoke to them, and she felt sorry for them. Murray said the first time she heard a rumour about Sgt McCabe, in early 2014, it was not from a garda source. “The person didn’t go into a lot of detail about it. It was a very small interaction,” Murray said. Murray said she was shocked when she found out that Supt Taylor had named her to the tribunal as someone who had been negatively briefed. She said she had met with Supt Taylor and he did not admit that he had given her name to the tribunal, and a few days later she received a letter from the tribunal. “My fear was he had named me as someone to bolster his own story, and I was correct,” Murray said. Murray said that going to meet the D family directly was “the best check and balance” she could have carried out to check the story. Email “Journalist on Miss D interview: 'It wouldn't have been material that would be published in the Sunday Times'”. Feedback on “Journalist on Miss D interview: 'It wouldn't have been material that would be published in the Sunday Times'”.